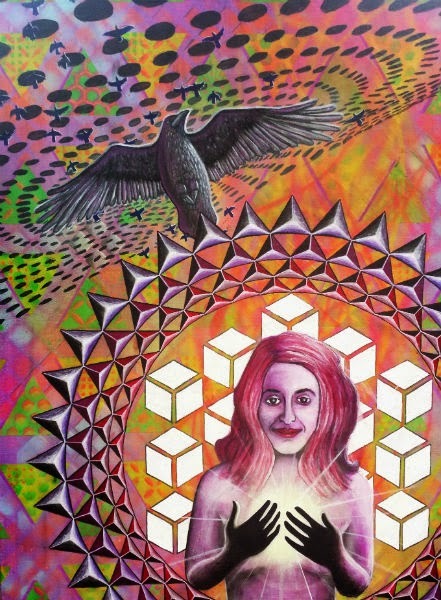 When I saw Drake Arnold’s Facebook post saying his painting Giver of Light had been stolen, I remembered being captivated by it at Suwannee Hulaween. It stood alone so I didn’t get the chance to acquaint myself with the artist, but I saw the post because it was shared by a friend who’d also been to the festival. I felt dismay and disappointment hearing that this happened at what had been such a beautiful fest (and knowing that it happens at other fests, too). So when I saw the painting again at Bear Creek Music Festival, back in the hands of its creator, I was delighted and intrigued. I wanted to know how it had found its way home. I spoke to Drake and learned that the Facebook post had actually played a big part in the painting’s return, a bigger part than even he thought it would. “I kind of assumed my post would get shared five or ten times by my closest friends and family. The response my post received was incredibly humbling. It was shared 436 times in just a couple of days and has a total reach of over 50,000 people,” he said. Eventually one of those shares reached the person who had taken the painting, a man in Illinois who messaged Drake and explained he’d been trying to help, not cause trouble. Drake had left the painting in the “Spirit Lake” area of the festival — which was decked out in art installations of all sorts — because he “would rather have people enjoy it than to just have it put away in [his] car or tent for the night.” When he came back a few hours later to pick it up, it was gone. 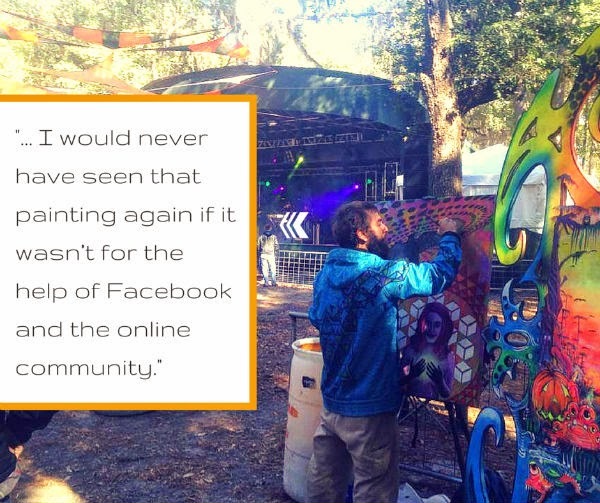 He offered the man who messaged him a reward for the safe return of his painting, and he got it back just before Bear Creek, about 10 days after it went missing from Suwannee Hulaween (both fests are held at the same venue, Spirit of the Suwannee Music Park in Live Oak, Fla.). In return he sent six prints of his artwork. He then shared another post announcing the painting’s return and thanking the online community for its help. Drake was also grateful for the chance to complete Giver of Light, which was “nowhere near finished” at the time it was taken. He’d been working on it for six weeks, and continues to do so now. “I was mostly hurt that I would never get the chance to truly finish this piece. … [I]t was really sad for me to see this unfinished project that I had great plans for, that I had been spending all this love and time on just disappear without at least getting to see it through to completion,” Drake said. It was inspired by a friend named Katey, whom Drake had depicted in a previous painting called To Shed Light or Cast Shadows. When that work was complete, he felt the painting portrayed his friend in a negative light. He wanted to create another work that showed her best human qualities. “Someone bursting forth with light and love, honesty and freedom,” he said. Several people have expressed interest in purchasing Giver of Light, though it is still a work in progress. He hopes it will be completed within two months. To inquire about this and other works you can visit Drake’s website or like his Facebook page.